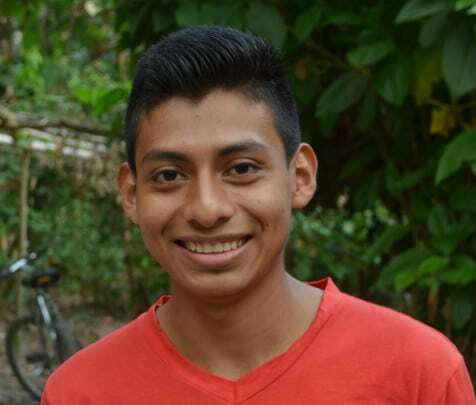 Mauricio, 22, is a fifth-year public accounting student at theNational University of El Salvador. He lives at home with his father, a farmworker, and his mother, a housewife who also sells grains, as well as his three younger sisters, older sister and older brother. He describes his family as happy, very respectful, very well-behaved and with good manners. Mauricio wakes up each morning before dawn, around 3:50 a.m., so he can catch the bus at 4:45. It is a two-hour bus ride to the university where he starts class at 7. He then leaves campus at noon and returns home to help around the house, visit with his family and complete schoolwork before turning in each night around 9:30 p.m.
We asked Mauricio to answer a few questions to help you get to know him better. Below are his responses! What are some of your professional aspirations? To work in a bank or other financial institution. Why do you think your education is important? Its important because it helps me develop personally; it helps me be a good person with strong principles for the sake of my family and society. My father, Carlos, and my mother, Candelaria, are the two people who have motivated me the most because they are the ones whove supported me. Not only are they my parents, theyre my friends and theyve been through the good and the bad with me. They always want the best for me. They guide me and serve as examples so I can succeed. How has the crime/violence in this country affected you personally? Its affected me in severalways: economically, psychologically and socially. Economically, Ive been assaulted and robbed and if you dont give them what they want, they threaten to kill you or they do kill you. Psychologically, one runs around scared that hell be assaulted. People are nervous wherever they go, whether its school or work. How do you think positive change can come about in your community or country? Better participation by parents in their childrens education would be one solution, so their children turn out well in the future. Another would be stricter laws against criminals. Tell us about your community service project. Im working [with other scholarship students]on a backyard vegetable garden. Its important because it helps me gain knowledge about agriculture. What is your favorite book or genre? My favorite books are by Karl Marx. One of my best qualities is that I dont give up. Another is that Im very dedicated and perseverant. What is something surprising about you that only a few people know? Something surprising other people dont know is that losing bothers me. What would you say if you could speak face-to-face with your sponsors? First I would greet him, then ask how he is. I would say, Its a pleasure to meet you. Thank you for the financial support that you give me. And Id tell him that it helps motivate me to keep studying and if it werent for his support, it would probably be much harder and I would have to struggle much more to be able to go to school. I would say Thank you, and God bless you today and always.